Like the Roland R8, the Yamaha RY30 is one of a rare breed of 90's drum machines that can still hold its own alongside more modern pieces of kit, without being used a a novelty retro machine or having a specific sound that has been used to death, although like the R8 its not often that you seem to see anyone actually admitting to using one. These days you don't often see a RY30 on peoples kit lists alongside their more fashionable Jomox and Elektron machines, but this is possibly down to the fact that it just gets on with supplying solid and sometimes bizarre digital percussion without drawing attention to itself by trying to eat up all the space in your mix or providing all the latest sounds that'll be unusably clichéd within 6 months. Despite the fact that the RY30 was produced in the early 90's, Yamaha wisely didn't exclusively fill it with the fashionable sounds of the time, and so it doesn't sound anywhere near as dated as other machines from the same era. 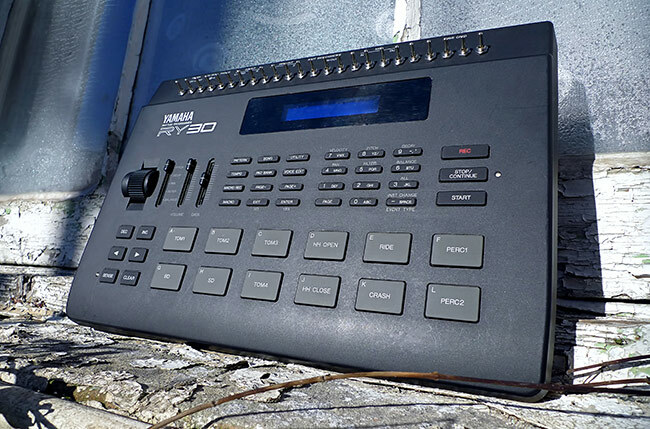 As the RY30 is essentially most of the synth engine from Yamaha's digital synths of the time with some drum sample ROM's strapped on, you get a range of sound shaping tools you won't see on other drum machines of the early 90's. These include a selection of basic synth waveforms along with various digital filters and control over several parameters for each drum sound via a modulation wheel. The changes can be recorded into the patterns in realtime. We're all horribly spoiled these days and this would be a basic requirement on a modern machine, but other than the Roland R5 and R8 pretty much nothing else could perform such witchcraft at the time. If you want the full specs of this machine, take a look HERE. If you want to hear an unmodified RY30 in action, you can't go far wrong with these two Autechre tracks from 1996. Our mods have added a 24 way 'Bend Bus' based switching matrix that feeds the digital sound sample data back on itself into places it was never designed to go. This results in some very industrial sounding distortions, bit crushing, comb filtering, sample splicing and sound swapping effects that still sound 'natural' in some undefinable way, as the effects seem to sit in the stereo mix in a far more convincing manner than you hear on similar modified drum machines. Nothing seems particularly out of place, as if the RY30 was always designed to be producing such incontinent sickness and was just waiting for its real potential to be unleashed. We decided to go with a switch matrix rather than a patchbay on this machine as the bent effects available seem to lend themselves to creating evolving changes while a pattern is playing. This kind of response is easier to achieve with the speed of just activating or deactivating switches, rather than having to repatch cables. As you can hear from the demos below, it is still possible to make the kind of dramatic and excessive changes normally associated with bent drum machines, but you can also subtly vary a pattern from one bar to the next to allow things to evolve in a more organic way. We've also changed the normal Yamaha yellow LCD screen for a blue one. Failing LCD screens seem to be a common problem on RY30's and this one was complteley unreadable due to about 80% of the horizntal lines missing. If it wasn't for the insane prices that RY30's seem to sell for these days we'd definitely be looking to get hold of one for the circuitbenders studio, as i don't think we even scratched the surface of what might be possible on the demos! About 15 years ago when we first considered looking for a RY30 to try to mod they cost around £80-£90, which seemed fairly expensive when a TR707 wouldn't cost you more than £60-£70 at the time. These days you'll be lucky to get one for £200-£250! Take a listen to the demos below to hear the kind of sounds these mods can produce. All the sounds and effects were created live by processing drum patterns using the switch matrix.